Most widespread on or near sandy shores and dunes along the Great Lakes, often associated with pines; also inland and there occurring in a diversity of habitats: old fields and gravelly banks, usually with scattered red-cedar in characteristic “juniper savannas;” also occasionally in coniferous swamps (on hummocks in wet places); in oak-hickory forests and northward scattered under jack pine and aspens; in the western Upper Peninsula in crevices of rock outcrops. Our plants are almost all var. depressa Pursh, a ± decumbent form; the large cup- or saucer-shaped mats are characteristic of dunes and sandy places. However, several collections of upright, tree-like Juniperus from Alger, Antrim, Cheboygan, Emmet, and Montmorency Cos. are apparently J. communis var. communis, presumably spread from planted Juniperus of Eurasian origin. Various Old World forms of this species are cultivated for ornament. The Alger Co. collection notes a height of 8-10 m, though 4-5 m is more typical. The first collection of the var. communis was from Antrim Co. in 1953. Besides the growth form as small trees with upright trunks, the var. communis has longer needles, the longest 15-20 mm or more long in Michigan collections, and the glaucous central stomatal band occupies much of the needle width, being much wider (ca. 2-4 times) than the narrow green margin on either side of the needle. 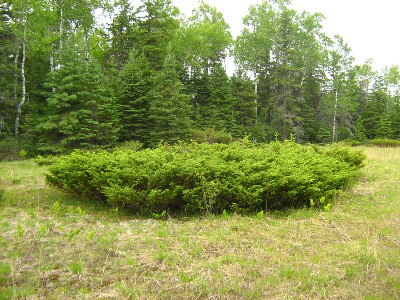 In the common spreading, shrubby var. depressa, the longest needles are less than 16 mm long even in shade forms, often only 6-10 mm in material from rocky shores, and the central stomatal band is narrower, usually 1.5 times or less as wide as the green margin on either side of the needle. See Adams, et al. (2016) for additional information. MICHIGAN FLORA ONLINE. A. A. Reznicek, E. G. Voss, & B. S. Walters. February 2011. University of Michigan. Web. 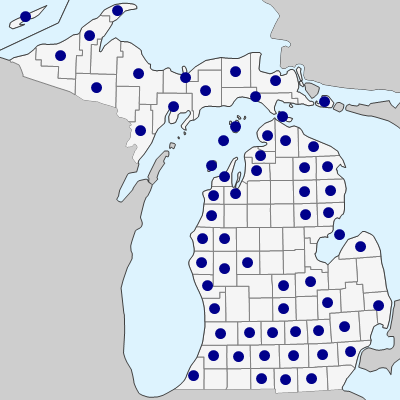 April 18, 2019. https://michiganflora.net/species.aspx?id=887.